Quite long time ago was last experiment on Spicyblog.ru. At this time I wanted to bake something. In my case, the oven is not really intended for real baking, because complies pretty bad with temperature control. So I limited with package of defrosted puff pastry. 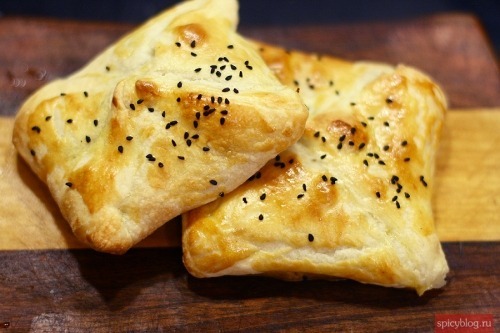 It's very convenient to use, besides, puff pastry is very versatile. 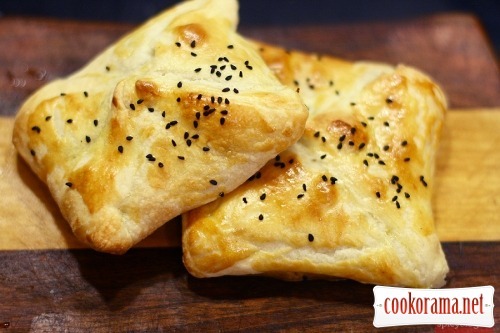 Cover stewed meat with it in baking dish, or cut in various shape and sprinkle with cinnamon and powdered sugar, then put in the oven, and in 30-35 min you`ll get appetizing, golden crust and under it a fluffy and delicate dough. However, this time, the filling has become a testing ground for creativity. List of ingredients may be slightly alert. Indeed, the filling for patties I decided to make a curry with beef, and for this species of Indian dishes (as, for all other) is used a big amount of various spices. Often, the list of spices in traditional Indian cuisine spans multiple pages, so I reduced to the minimum necessary exotic ingredients. Therefore, my curry can not be called Indian. So, dice meat of about 1,5 сm. Finely chop onion, garlic, chili, ginger and tomatoes. Put deep pan on strong heat, pour 2 tbsp of oil. We need refined oil, to avoid unnecessary flavor. Add spices in oil. Heat immediately make spices open up and release their full flavor. Once that happens, wait for 10 sec and add in pan onion, garlic and ginger. Then chili, in another 20 sec. 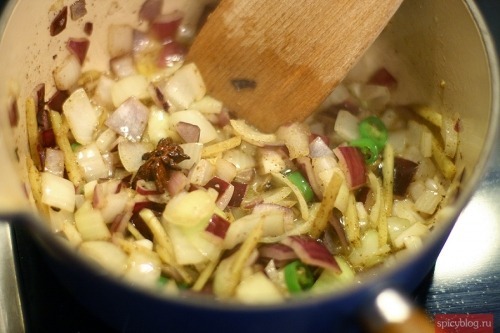 Cook, stirring, till transparency of onion. Next, add meat. Mix the contents of the pan well, to cover all with spices and juices from vegetables and meat. Add tomatoes, salt and mix all again. 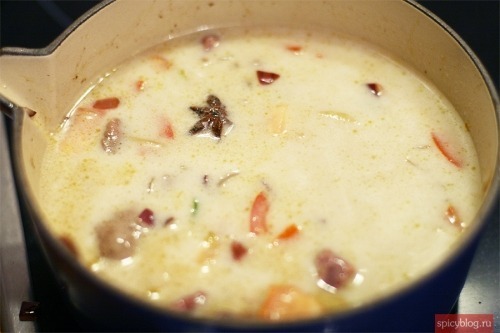 Pour with coconut milk, bring to a boil. Next, reduce heat to medium and cook curry for 1 hour, or to full compliance and tenderness of the meat. Contents of the pan should be pretty thick, if not, use less liquid for stuffing. Mix curry well, I did that,to fall meat apart and slightly thicken curry, making it more like a filling for patty. Put curry aside. Heat the oven at 200° C. Cut each layer of dough (there are two of them in package) in 4 squares. On slightly sprinkled with flour surface roll each square into thickness about 0,5 сm. Put in center of each square 1-2 tbsp of stuffing. Smear edges with mixed egg, combine edges, then edges of dough layers, forming a small quadrangular patty. Repeat with remaining dough and stuffing. Place the patties on a baking sheet, covered with parchment. Grease with mixed egg and sprinkle with Nigella seeds (if you accidentally got some, as I have) or sesame or some sea salt crystals. In fact, it is not particularly important point. Bake for 12-15 min or till golden crisp. Top of recipe "Patties with curry from beef"